There’s a chocolate cake recipe our family has been making for years. It’s one of our favorite of all cakes – mostly because it’s not dry like many homemade cakes can be. But – you know how my body won’t let me eat much sugar anymore? I mostly don’t even want it – but sometimes I just get a hankering for something chocolaty. 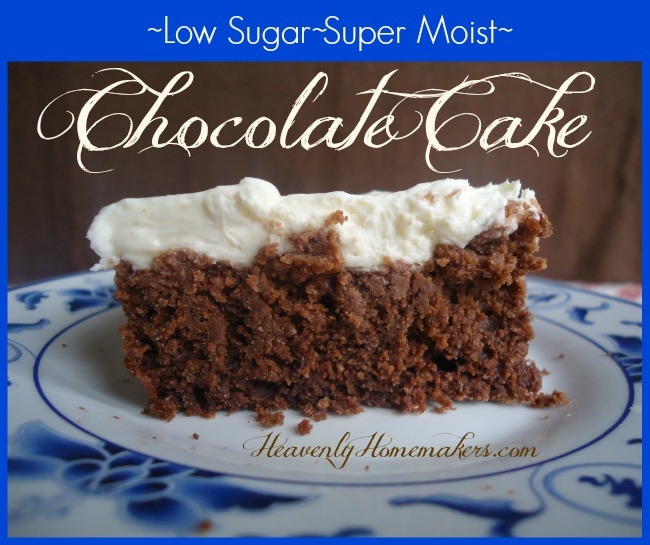 That’s what inspired the invention of Chocolate Whipped Cream, Coconut Fudge Bars – and now this – a Low Sugar Chocolate Cake. I decided to try making our favorite chocolate Texas Sheet Cake recipe with less sugar to see how it would turn out. You guys!!!!!! Why in the name of a diabetic coma do recipes (including many of mine) call for so much sugar???!?! Originally, this recipe includes 6 cups of sugar. SIX. That’s 2 cups in the cake and 4 cups in the frosting and none of us can possibly imagine that cutting out so much of the sugar would still produce a cake that actually tastes good. Well neener, neener to all of us. I just recreated this cake to include a grand total of 1/2 cup of sugar. Yes, that is one-half cup. Total. Neener. I love this cake like nobody’s business. But what do I know? I’m the one who can no longer tolerate much sugar, so even the barely sweet stuff tastes quite sweet to me. The true test was serving this to my children. They still love their sugar (what kid doesn’t?) and they are used the “the regular way” we’ve always made the Texas Sheet Cake. Would they feel like the cake wasn’t sweet enough? I mean, going from 6 cups to just 1/2 cup of sugar – that’s a big drop. They ate the cake, they liked the cake, they had seconds on the cake (which was only allowed because of the low sugar content). This makes me think that we could likely drastically cut the sugar in most cake and cookie recipes and everyone would still enjoy the treats. Why yes I will be testing this theory. And I will share my results with you – one recipe at a time. Pour batter into a 9x13 inch baking pan. Bake in a 350° oven for 20-25 minutes or until a toothpick inserted in the middle comes out clean. Allow cake to cool completely before frosting. In a large bowl, whip cream until soft peaks form. Add softened butter, cream cheese, vanilla, and stevia – whipping until well combined and smooth. Spread over cooled cake. Store in refrigerator. Makes about 20 servings. 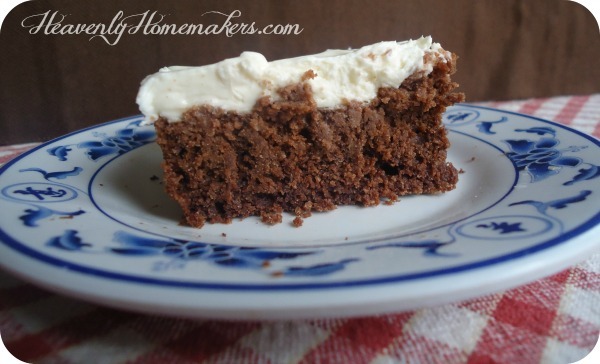 Part of what makes this cake so moist is the use of sour cream. It doesn’t hurt that we use an entire cup of coconut oil. Bring on the healthy fat! You can use regular whole wheat flour if you like, but whole wheat pastry flour (ground from soft white wheat berries) really helps make this cake less dense. So here’s to this amazing Low Sugar Chocolate Cake. Now we can have our cake and eat it too and not even have a sugar crash afterward. Of course, we will also still be eating our veggies with this lovely side of chocolate. Amen and amen. Have you tried cutting back on sugar in your diet? Have you found recipes to turn out successfully when you cut the sugar? YES! I know that when it’s too sweet for me (someone who has loved sugar all her life) that it’s saying something. So thankful to be learning more about cutting back on sugar! I reduce sugar all. the. time. It is rare if I make a recipe “as is”. I began years ago when my children were small to cut back on the sugar. Each time I made the recipe I would use less than the time before until I knew just how much to cut and have it still taste good. Now as adults (early 20’s) they do not like store bought items as they can taste the chemicals and treats other people make they will comment at home how the item was so sweet you did not really get a true taste of the item! This is especially true of jam. I so wish I would have started this earlier with my kids. Hopefully mine will catch on to what your kids have learned. I love that they are at least beginning to see that less sugar still makes a tasty treat! Yes, I’m having a great success only using a fraction of the sugar called for in many recipes. Thank you so much for this Texas sheet cake recipe. It’s one of our family’s favorite cakes. I normally make a chocolate icing to pour over the top but your cream cheese icing looks so good I’ll have to try that next time. 1. Do you usually prefer the regular yeast bread you make or sourdough and why? 2. How do you avoid the “blowouts” on the sides of the loaves of bread when baking? Our family doesn’t love the taste of sourdough, so I quit making it because it was difficult for me to go to the effort of keeping up with sourdough starter and then have my kids turn up their noses. :) So I stick with regular yeast bread. I actually haven’t made bread in months. I’ll have to make a batch or two before it gets too hot to bake! I don’t usually have blowouts on the sides of my loaves, so I’m not quite sure what you mean. I wonder if maybe your second rising is causing too much air to get in? Maybe cut back on second rising time? I almost always use honey when baking. Since it is sweeter than sugar you sub 2/3cup honey for a cup of sugar but, I also half the honey in most things. So say the recipe calls for a cup of sugar, I use 1/3 cup of honey instead. I have had very good luck this way. Sometimes I will even leave out most or all of the honey and then spread it on top. We use local raw honey and I understand that you lose some of the benefits if it is heated. It can be a bit messy this way but I think it’s worth it. I have had success doing this with your baked oatmeal and shortbread as well as a few other recipes. Also I tweaked your breakfast cookie recipe. You might enjoy trying it since you are trying to avoid more sugar. I loved the idea of a breakfast cookie but it seemed like a lot of honey to me. I was afraid that if I cut out to much it would mess up the consistency of the dough so, I decided to replace the honey with applesauce. I didn’t really want the honey mess on top of my cookies so I decided to add a dropperful of liquid stevia to the applesauce. I made my own liquid stevia so I’m not sure how it compares to what you use so you might need to play with the amount. They turned out great! They were not real sweet but, that is how I like them. They might not compare to your original but, if you would like to avoid the amount of honey in those you might give it a try sometime. Yay, great idea on the applesauce! I haven’t made my breakfast cookies for a while, but next time I do, I’m for sure cutting back on the honey. I am just about ready to mix up a batch of breakfast cookies and trying to decide how I can cut back the honey. I am out of applesauce right now so not sure what I should do. Any ideas? My only thought would be maybe mashed bananas of possibly other pureed fruit. Thanks so much for sharing this recipe, Laura! Your timing couldn’t be better. We have 2 birthdays to celebrate this month – one is a diabetic, the other is trying to lose weight. I should probably make the jump to stevia soon! I have a terrible sweet tooth, yet, I hate that sugary feeling after eating something really sweet. It makes me feel blah . . . I have a bad habit of stress eating sugar, which just makes me feel worse! It is a bad cycle. I feel ya! That was me for years and years. Stevia has been a nice change of pace. I keep waiting to hear news of Baby Girl! Praying for you!!! Yes, I always lower the sugar in dessert recipes, usually by half. My family finds them way sweet enough and we always wonder how others eat them with so much sugar. :) I also cut the salt in half as well. I think we’ve been so used to full sugar content in desserts that we don’t even realize how super sweet something is until we cut back. I’m so thankful to finally be figuring this out so we don’t keep sugaring ourselves so much! Thanks again for another great recipe. Have you considered making another tab in your recipe list for the recipes you have cut the sugar back? I am also trying to cut back sugar and it is so hard. You could label it low sugar recipes or something like that, it is hard to label since most low sugar recipes use a low cal sweetener that is not real food. That’s a great idea! Hopefully as I continue to add more low sugar recipes (and tweak my other recipes to make them also lower in sugar), I’ll be able to build a page with all the links. If the original recipe called for SIX cups of sugar, does it significantly cut down on the amount of cake it makes? Logic tells me there should be 5 1/2 cups less of cake, but I’m sure the chemistry doesn’t make quite that happen. Just wondering as I attempt to experiment as well. But I’ve never taken out more than 1/4 cup or so, for fear of failure!! It’s amazing that cutting it down really doesn’t effect the cake. Part of that is that 4 of the original cups of sugar were in the frosting. The 2 cups in the cake got cut down to 1/2 – and it did not effect the cake batter one little bit. I love this! I am still skeptical about stevia. Do you have a post where you talked about it? It sounds like one of the many artificial sweeteners (splenda, BLECH!!). But stevia is an herb that is naturally sweet, so it is a real food. It is bitter if overused, but when you use just a few drops, it sweetens naturally without effecting blood sugar. I’m very thankful to learn about it! Could you make the icing chocolate? Do you think I could use buttermilk or yogurt in place of the sour cream! Both of these are from my raw milk, but my sour cream isn’t, so I prefer using buttermilk or yogurt. Yes, I think either buttermilk or yogurt would work great! I used yogurt in mine & it worked well. This is the best chocolate cake ever!! It is very moist. Brought it to a church picnic yesterday but there were so many desserts only 1 piece of cake was eaten. My family is happy to have so much cake left! I made this for my daughter’s birthday on Sunday. It is very good and does not taste low sugar at all. I used white whole wheat instead of pastry flour and it was great, not dense at all, very light. Looking forward to trying this chocolate cake. A surprise is the HUGE amount of sugar that many fruit pie recipes call for. Not neccessary! Most EVERY apple pie recipe you’ll find calls for at least a full cup of sugar (! ), occasionally 2/3 cup for a 9-inch pie. My secret is ripe Golden Delicious apples. You hardly need any sugar. A 9 inch golden delicious pie takes about 2 tbsp. of sugar – and people rave. The same size green apple pie is great with a rounded 1/2 cup & some lemon juice. Hi Hi! Im excited to try your cake! My husband likes healthy foods but he gets shakey on the will power when he is away from home. Today is his birthday and I’m so proud of him working so hard to loose weight and fend off diabetes that I’m surprising him with cake! Im pretty sure he thought that was banished from our home. For frosting i’m using one that i experimented with over the years for my grandmother. I use a gelaten based product called dream whip combined with sugar-free pudding mix and whipped with milk to make a foamy topping. He is also less tolerant of dairy so i might see if i can make an almond milk work. They usually don’t bind well with pudding, but I wonder if adding a little fat for structure may help? Been loving the coconut oil lately. Thanks for this recipie!!! I made it but I would suggest adding more cocoa or chocolate extract for a richer chocolate taste it was a little weak in that area. What a great idea! That sounds delicious! Can I use coconut sugar instead?